8 were arrested for stone pelting from Kalachowkie, Kurar, Goregaon and surrounding areas. 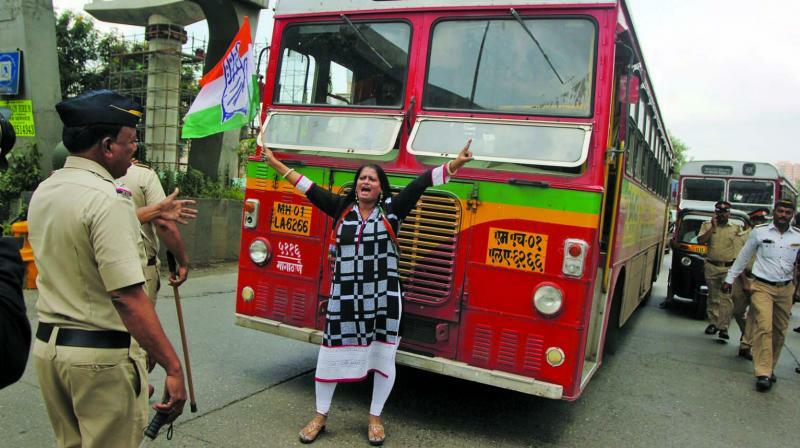 Mumbai: Mumbai remained calm except stray incidents of stone pelting damaging BEST buses and private vehicles that were reported from some pockets. The city police detained at least 882 persons from various parts of the city for disturbing law and order situation. Total six people were arrested by Pune Police. The officials registered eight separate cases following the stray incidents of violence. The Bharat Bandh carried out on Monday took a violent turn as at least 17 BEST buses were damaged due to stone-pelting by the protestors. The officials stated that there were no casualties. “Few buses were damaged, mostly on the window panes, fortunately no one was injured in these incidents,” said Hanumant Gophane, BEST chief spokesperson. Stone pelting incidents on vehicles were also reported at Vashi Naka. However, the buses and public transport like auto-rickshaws and taxis were plying regularly throughout the day as the auto-rickshaws and taxis drivers union did not participate in the bandh. 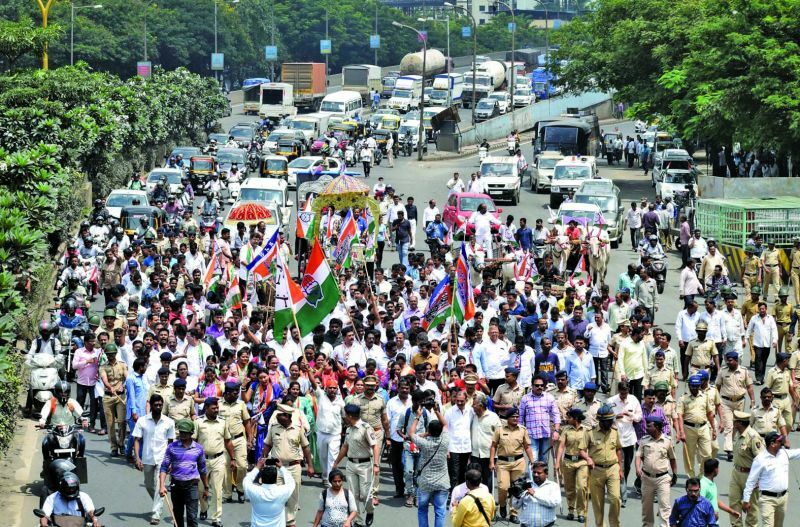 At various places, workers of Maharashtra Navnirman Sena (MNS) and Congress also blocked the roads including Western Express Highway and some roads of Thane area, disrupting the traffic for around 30-40 minutes. The protestors forced petrol pumps to shut down and some shops too. Meanwhile the MNS came to a petrol pump at Chembur with a donkey to demonstrate against the hike in fuel prices. The police had stepped up security in the city after some regional outfits backed the bandh. The city and railway routes witnessed brief blockades that were cleared by the policemen deployed. Apart from the local police, platoons of the State Reserve Police, rapid action force were also deployed across the city for timely response. “While no serious incident was reported, we arrested eight persons for stone pelting. These incidents were reported from pockets of Kalachowkie, Kurar, Goregaon and surrounding areas. The eight cases registered were across various police stations in the city,” said Manjunath Singe, deputy commissioner and Mumbai police spokesperson. 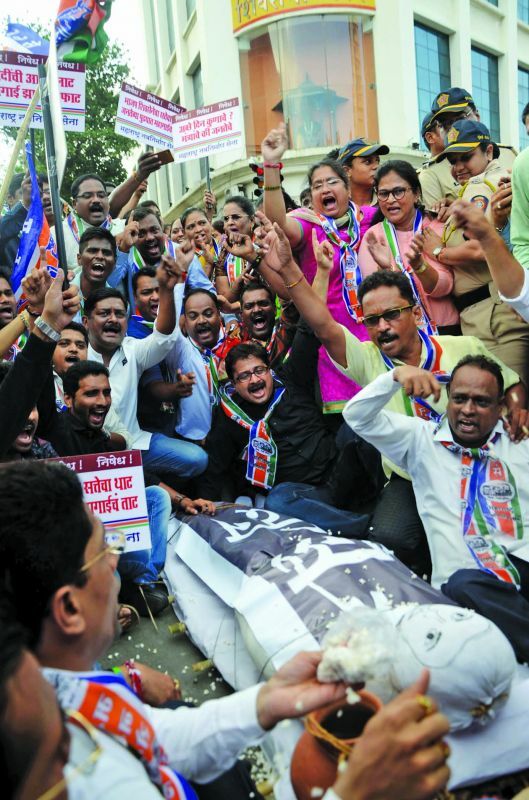 The arrests were made for damaging public property as per the IPC and under sections of the Maharashtra Police Act. The police presence was visible on the streets till late evening on Monday. The Government Railway Police (GRP) had been on their toes since morning following reports of agitations planned at some of the stations. “Protesters from Andheri and Dadar railway stations were cleared immediately. We did not allow the protesters at Govandi station to enter station premise. Situation was normal and trains on all routes of Central, Western and Harbour lines were running on time,” said Purushottam Karad, deputy commissioner of police, GRP.